Forugh Farrokhzad (Persian: فروغ فرخزاد‎‎; January 5, 1935 – February 13, 1967) was an influential Iranian poet and film director. She was a controversial modernist poet and an iconoclast, writing from a female point of view. Forugh (also spelled Forough) was born in Tehran to career military officer Colonel Mohammad Bagher Farrokhzad (originally from Tafresh city) and his wife Touran Vaziri-Tabar in 1935. The third of seven children (Amir, Massoud, Mehrdad, Fereydoun Farrokhzad, Pooran Farrokhzad, Gloria), she attended school until the ninth grade, then was taught painting and sewing at a girls' school for the manual arts. At age sixteen she was married to Parviz Shapour, a satirist. Farrokhzad continued her education with classes in painting and sewing and moved with her husband to Ahvaz. A year later, she bore her only child, a son named Kamyar Shapour (subject of A Poem for You). Farrokhzad, a female divorcée writing controversial poetry with a strong feminine voice, became the focus of much negative attention and open disapproval. In 1958 she spent nine months in Europe. After returning to Iran, in search of a job she met film-maker and writer Ebrahim Golestan, who reinforced her own inclinations to express herself and live independently. She published two more volumes, The Wall and The Rebellion before traveling to Tabriz to make a film about Iranians affected by leprosy. This 1962 documentary film titled The House is Black won several international awards. During the twelve days of shooting, she became attached to Hossein Mansouri, the child of two lepers. She adopted the boy and brought him to live at her mother's house. In 1964 she published Another Birth. Her poetry at that time varied significantly from previous Iranian poetic conventions. On February 13, 1967, Farrokhzad died in a car accident at age thirty-two. In order to avoid hitting a school bus, she swerved her Jeep, which hit a stone wall; she died before reaching the hospital. Her poem Let us believe in the beginning of the cold season was published posthumously, and is considered by some to be one of the best-structured modern poems in Persian. Farrokhzad's poetry was banned for more than a decade after the Islamic Revolution. A brief literary biography of Forough, Michael Hillmann's A lonely woman: Forough Farrokhzad and her poetry, was published in 1987. Farzaneh Milani's work Veils and words: the emerging voices of Iranian women writers (1992) included a chapter about her. Nasser Saffarian has directed three documentaries about her life: The Mirror of the Soul (2000), The Green Cold (2003), and Summit of the Wave (2004). 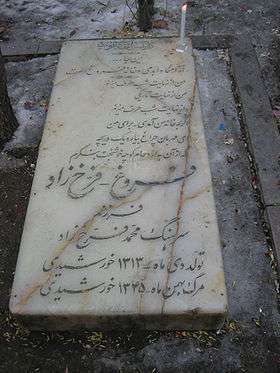 Forugh's graveside, Zahir o-dowleh cemetery, Darband, Shemiran, Tehran. The poem “Conquest of The Garden” emphasizes the role of women within a restricted society and presents the thoughts and emotions of an Iranian woman who asserts her own selfhood, subjectivity, and agency. Farrokhzad`s poetry became controversial for its bold, female voice and its harsh criticism of the position of women in Iranian society. This poem is a popular love poem in the modern Iranian literature among both female and male readers. The poem's assertion of female subjectivity is transgressive both for pre- and post-revolutionary Iran because it boldly presents the thoughts and emotions of the female speaker. The poem “Conquest of The Garden” begins with an indirect reference to one of the most well known stories in Iran and throughout the Middle East: the story of Majnun and Layli and its walled garden. In this story, two great lovers separated by the wall come together when the male lover Majnun (literally: lunatic or crazy in love) jumps over the wall to find his beloved Layli. Farrokhzad gives voice to the female lover, gives her subjectivity and agency equal to the male: “you and I.” This is a transgressive shift away from the woman as the “object of desire.” In Farrokhzad's poem, it is the Iranian woman who speaks. ^ Cite error: The named reference forughfarrokhzad.org was invoked but never defined (see the help page). And the truth that comes from eating from the Tree of the Knowledge of Good and Evil from the Bible—this truth affirms her assertion of female subjectivity. The significance of Farrokhzad as a female poet whose voice over a half century ago still resonates even more powerfully and directly than would be possible for women poets today inside Iran. Sholeh Wolpé edited the collection titled Sin: Selected poems of Forugh Farrokhzad, (Fayetteville [Arkansas]: University of Arkansas Press, 2007) ISBN 1-55728-861-5. Ali Salami translated Another Birth: Selected Poems in 2001 (Zabankadeh, Tehran) ISBN 978-9646117365. Hasan Javadi and Susan Sallee translated Another Birth: Selected Poems of Forugh Farrokhzad with her letters and interviews in 1981. A revised edition of the same volume is published by Mage Publishers (Washington, DC) in 2010 as a bilingual edition. Jascha Kessler with Amin Banani, "Bride of Acacias: Selected Poems of Forugh Farrokhzad" (Caravan Books, Delmar, N.Y., 1982) ISBN 0-88206-050-3. Farzaneh Milani, Veils and words: the emerging voices of Iranian women writers (Syracuse University Press, Syracuse, N.Y., 1992) ISBN 978-1-85043-574-7. A Rebirth: Poems, translated by David Martin, with a critical essay by Farzaneh Milani (Mazda Publishers, Lexington Ky., 1985) ISBN 093921430X. Kurdish: Haidar Khezri, It is Only Sound that Remains: The Life and Legacy of Forough Farrokhzad, with Translation of Two Collections of her Poetry ("Another Birth" and "Let Us Believe in the Beginning of the Cold Season"), published by Salahaddin University Press 2016. Michael Craig Hillmann, A lonely woman: Forough Farrokhzad and her poetry (Three Continents Press, Washington, D.C., 1987). ISBN 0-934211-11-6, ISBN 978-0-934211-11-6. Manijeh Mannani, The Reader's Experience and Forough Farrokhzad's Poetry, Crossing Boundaries - an interdiciplinary journal, Vol. 1, pp. 49–65 (2001). Michael Craig Hillmann, An Autobiographical Voice: Forough Farrokhzad, in Women's Autobiographies in Contemporary Iran, edited by Afsaneh Najmabadi (Cambridge [Massachusetts]: Harvard University Press, 1990). ISBN 0-932885-05-5. Ezzat Goushegir, The Bride of Acacias, (a play about Forough Farrokhzad). Chopra, R M, "Eminent Poetesses of Persian", Iran Society, Kolkata, 2010. I Shall Salute the Sun Once Again, English-language documentary about Forough Farrokhzad, by Mansooreh Saboori, Irandukht Productions 1998. Moon Sun Flower Game, German Documentary about Forough Farrokhzad's adopted son Hossein Mansouri, by Claus Strigel, Denkmal-Film 2007. ↑ Hamid Dabashi (20 November 2012). The World of Persian Literary Humanism. Harvard University Press. pp. 290–. ISBN 978-0-674-07061-5. Daniel, Elton L.; Mahdi, Ali Akbar (2006). Culture and Customs of Iran. Greenwood Press. pp. 81–82. ISBN 978-0-313-32053-8. 1 2 Janet Afary (9 April 2009). Sexual Politics in Modern Iran. Cambridge University Press. pp. 283–. ISBN 978-1-107-39435-3. 1 2 Parvin Paidar (24 July 1997). Women and the Political Process in Twentieth-Century Iran. Cambridge University Press. pp. 168–. ISBN 978-0-521-59572-8. ↑ "Forough Farrokhzad". Iran Chamber Society. Retrieved 21 December 2012. ↑ Полещук, Виктор (2002). Форуг Фаррохзад, Стихи из книги "Новое рождение". Inostrannaya Literatura (in Russian). Moscow (8). Wikimedia Commons has media related to Foroogh Farokhzad. A Review of Farrokhzad's "Another Birth"
"She loved as in our age; people no longer do"